Went to dinner at Eos, a fairly new Greek restaurant in Stamford that we really like, last night. 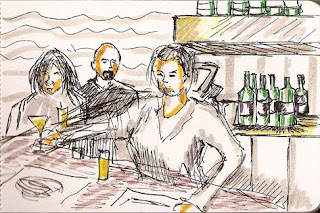 Sat at the bar, so I had a chance to do a quick sketch of the bartender and a few patrons. How was Eos? I have heard they wanted to be upscale Greek, did they accomplish this?